Despite the bad injury news that popped up this morning, it's still the start of the season. Expectations are fairly high, but what does the community expect? 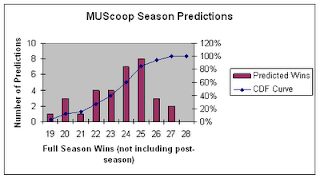 The Official 2008-2009 Season Prediction Thread on MUScoop.com has been getting some good input as people try to predict what they think will happen. Is this a representative view? Well, it depends on how you look at it. The sample size is small, but the range is fairly wide. I wouldn't bet money on it or anything, but it's for fun! The fans' view of the full season tells a hopeful story. 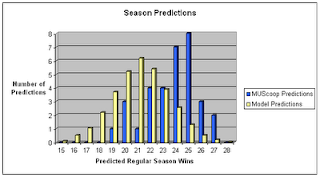 The range is fairly wide, with 80% of the predictions between twenty and twenty-six wins. However, Marquette fans are confident, with over 60% of the fans predict that Marquette will get to twenty-four wins or more, and over 40% of the fans are predicting that Marquette will get twenty-five wins. As a reminder, Marquette finished with twenty-two regular season wins last year. In the Cracked Sidewalks Prediction Thread, I referenced that my picks were an experiment. Basically, I used last year's data to create a model for the various matchups. There's a lot that went into it, so I won't bore you. First, let me orient on the color scheme. The light yellow colors are the games where the model sees a likely Marquette victory. 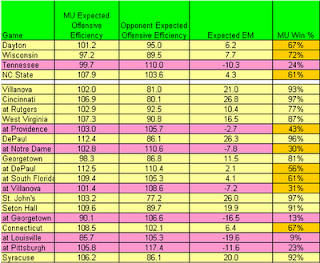 The pink colors are the games where the model predicts a Marquette loss. The areas shaded in orange are games that would be considered "up for grabs". For example, the game at USF is one Marquette should win, but not all the time. None of the results listed above should be all that surprising, except that I think the game at Georgetown is too low and the game at home against Syracuse is too high. This is an experiement and the model will get more accurate over time. I then ran a Monte Carlo analysis to see what the most likely scenario was according to the model. Unfortunately, there appears to be a disconnect between what the prediction model is telling me and what the fans' expectations are. Over 60% of the predictions thought Marquette would get over twenty-three wins, the model only gives that a 15% chance of happening. Over 40% of fans thought Marquette would get to twenty-five wins or more, the model only gives a 6% chance of happening. Yikes. One thing I've taken away is that I'm revising my expectations for the season down. Also, it's safe to say that Marquette fans have high expectations (although these predictions were mostly before the rash of injuries). Despite presenting information that's as welcome as a Brush Fire (don't worry - my home is safe), I'm actually an optimistic person. Right now, there's basically a 40% chance that Marquette will end up about the same as last year. In addition, it's an early season forecast based on an experiment, which is inherently inaccurate. No matter what the predictions are, everything starts tonight. Go Marquette!